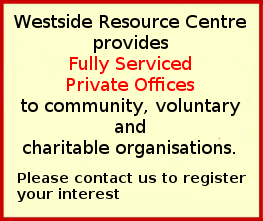 Westside Resource Centre Ltd. is a community-based organisation with charitable status. We opened our doors on Seamus Quirke Road in 2001, having moved from the old premises in the Westside Enterprise Park. The new Westside Resource Centre building was officially opened on 6th June of that year by President Mary McAleese. 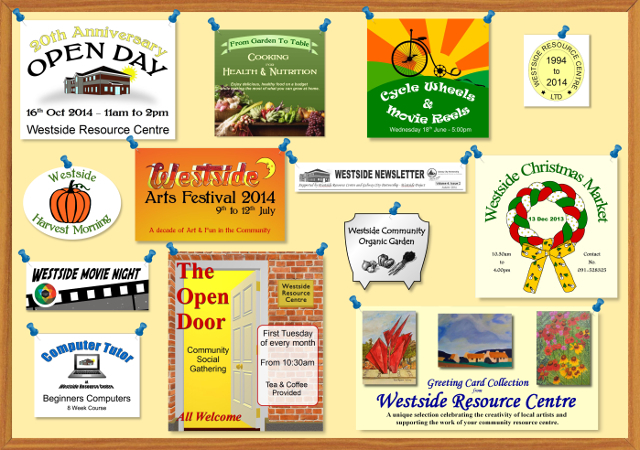 Westside Resource Centre is managed by a Voluntary Committee on behalf of the Local Community. Westside Resource Centre provides fully serviced offices to a variety of services and local branches of national organisations. We support community work in the local area and are very much involved with community initiatives such as Westside Arts Festival, Westside Christmas Market, Social Inclusion Week and Culture Night. Westside Resource Centre has a range of meeting rooms available for hire by community, voluntary and support groups. Over thirty local and national organisations use the resource centre's facilities throughout the year. The resource centre serves as a base for a number of local community groups such as Westside Community Patchers, Westside Men's Club, Westside Craft Group and Westside Community Organic Garden. 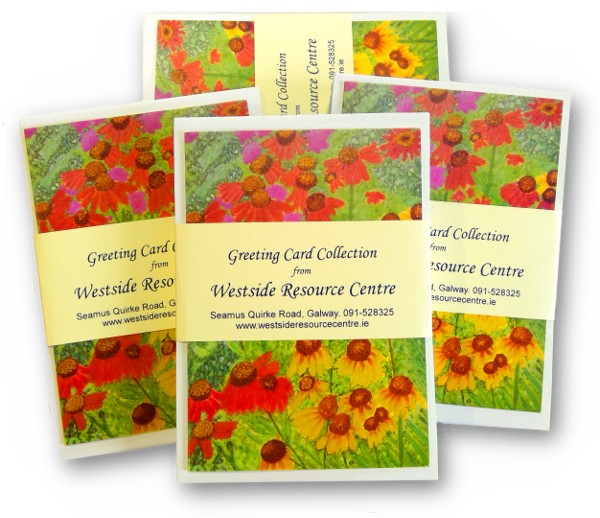 Westside Resource Centre's popular Greeting Card Collection has been reissued. The collection features work by artists from the local community and the cards are ideal for any occasion. A pack of 12 cards costs €10 and they are available from Westside Resource Centre reception. All proceeds from the sale of the Greeting Cards goes to support the work of Westside Resource Centre - a registered not-for-profit working with people and organisations throughout the Westside area. Galway City Local Community Development Committee (LCDC) has adopted an Equality and Human Rights Statement. As far as we are aware, they are the first LCDC in Ireland to do so. The statement – available here – is based on the values of Dignity, Autonomy, Participation, Inclusion, Social Justice and Environmental Justice. The committee is now looking at how best to use the statement as a reference point for the LCDC so that the values espoused will inform and guide their work over the months and years ahead. The LCDC is a committee of Galway City Council and is responsible for planning, coordinating and monitoring local development and community development programmes and funding in the city. Its mandate is to seek an approach that is integrated, based on community engagement, cost efficient and extracts learning for enhanced links between policy development and service delivery. Westside Resource Centre would like to acknowledge the kind support of Galway City Council’s Local Community Development Committee (LCDC) under the ‘Community Facilities Grant Scheme’ and the ‘RAPID Programme’. Westside Resource Centre has applied for - and has been granted - funding under these schemes. The funding has been used to carry out important upgrades and improvements at the resource centre and these enhancements will be of benefit to all who use the facility. Creative Writing, Yoga, Kumon and lots more. Full list of classes available here. Westside Resource Centre has received a number of paintings from an anonymous donor. We have decided to offer the paintings for sale to the public in order to raise funds for the running of the resource centre. Westside Resource Centre's Greeting Card Collection celebrates the work of local artists and crafts people. A pack of 12 cards costs €10 and the collection is available from Westside Resource Centre and from Westside Library. All proceeds from the sale of the cards will go towards supporting the services provided by Westside Resource Centre.